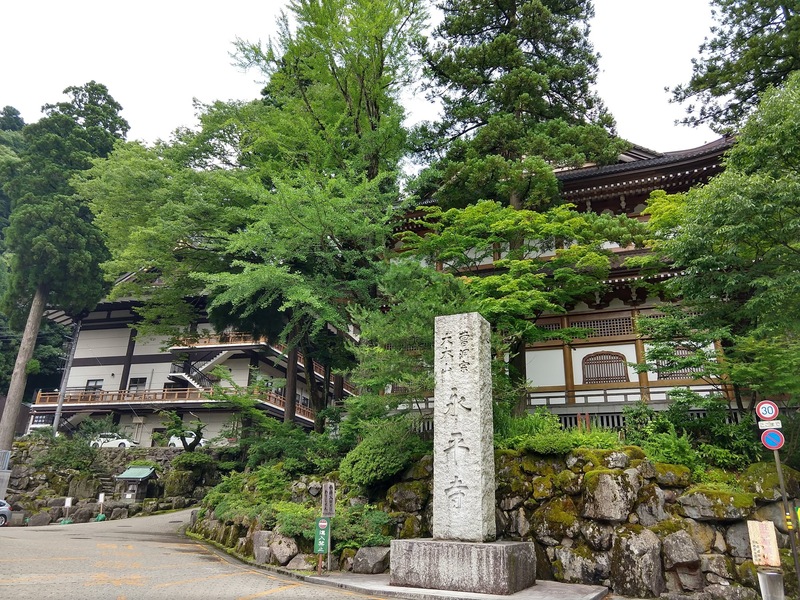 Eiheiji temple, located in the mountains outside Fukui city in central Japan, was established by Zen master Dogen in 1244 and is one of the two head temples of Soto Zen. In existence for almost eight centuries now, the temple is an active monastery where more then 150 monks are in training. 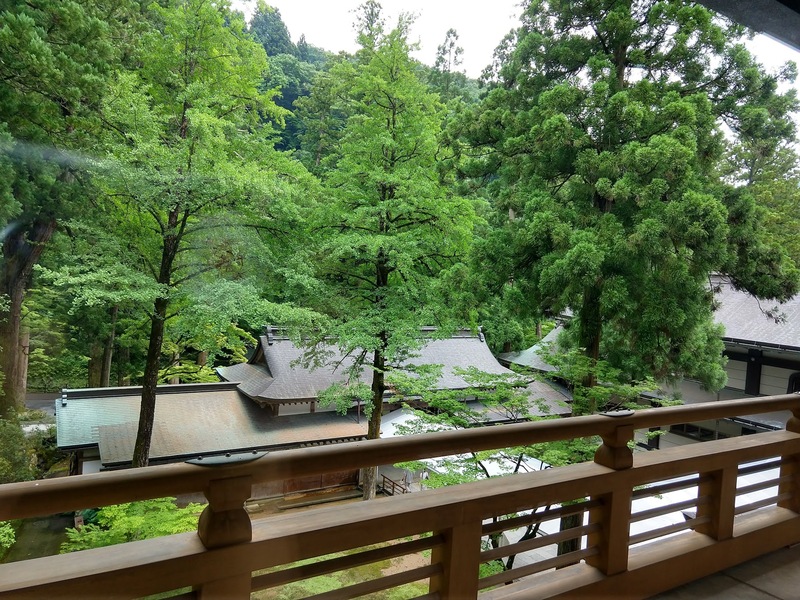 With dozens of buildings nestled in a forest of tall cedar trees, Eiheiji provides a glimpse into the 13th century world of Dogen, the founder of our Soto Zen lineage, from whom dharma as been transmitted over time and continents, from warm hand to warm hand. 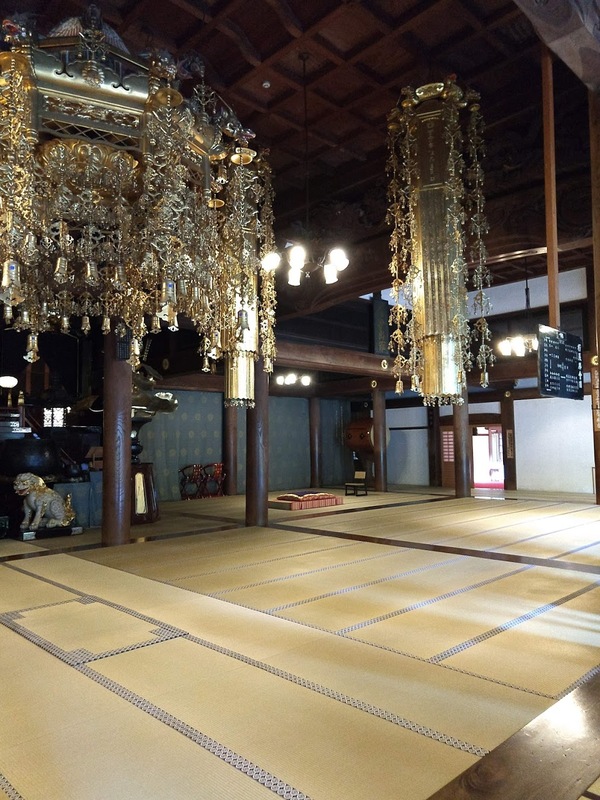 Thousands of people visit Eiheiji each year – all visitors are treated as religious trainees and are required to respect its traditional monastic practice and environment. 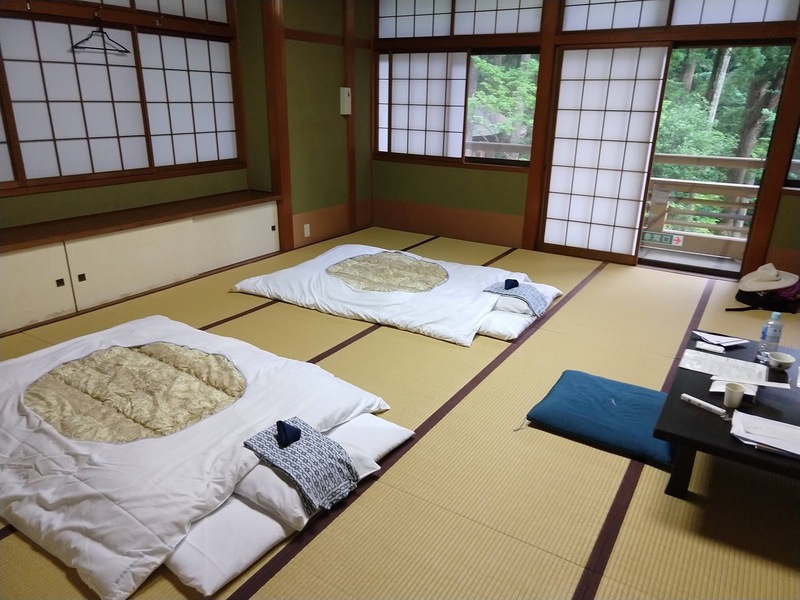 This summer, Yoko Ohashi, a longtime Brooklyn Zen Center sangha member, now serving as co-Ino and co-facilitator of the POC sangha, visited this cherished Soto Zen site. These are some impressions from that visit. 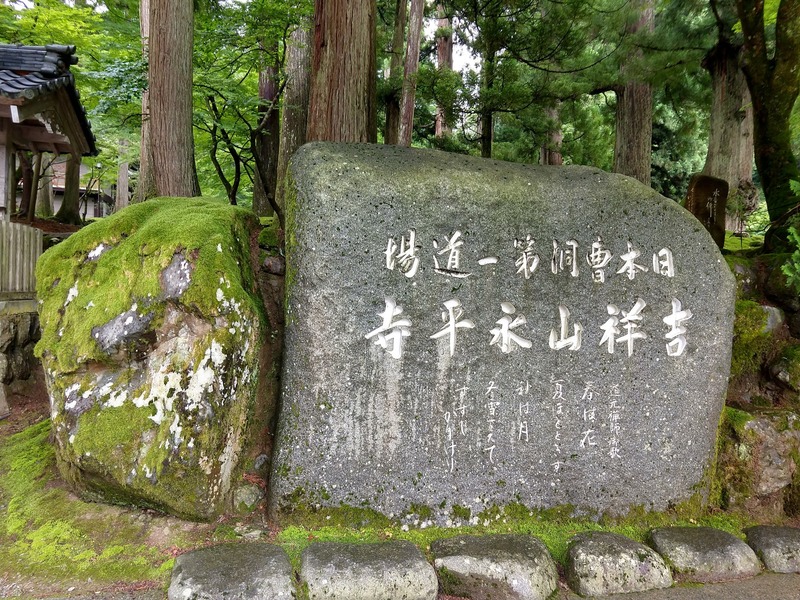 The town of Eiheiji, which was established and grew around the temple. The streets are filled with noodle places and souvenir shops. 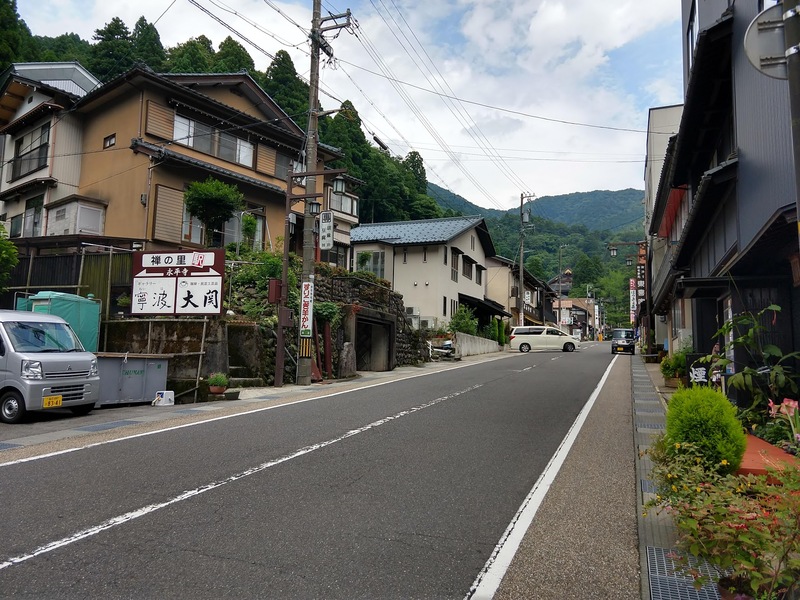 The atmosphere is that of a place past its heyday, when the temple dominated the life of the communities in this mountainous area. From town, a bus takes visitors to the temple’s entrance. One of the gates to the temple. Visitors have to cross multiple, nested entrances, before reaching the monastery. Japanese people like to visit temples, taking it as an opportunity to make resolutions, especially around New Year’s. 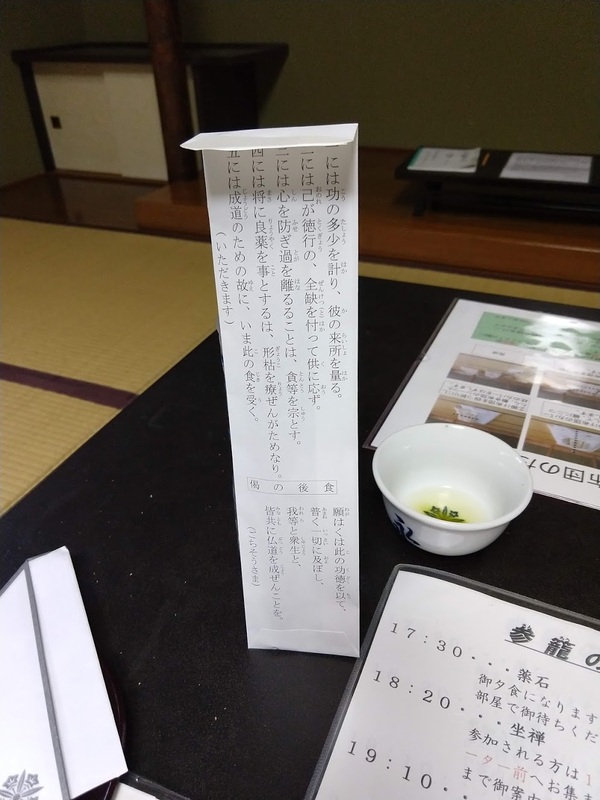 On my arrival, the detailed care of Zen practice showed up immediately: there was a carefully hand-written note with my name signaling the place for me to store my shoes. 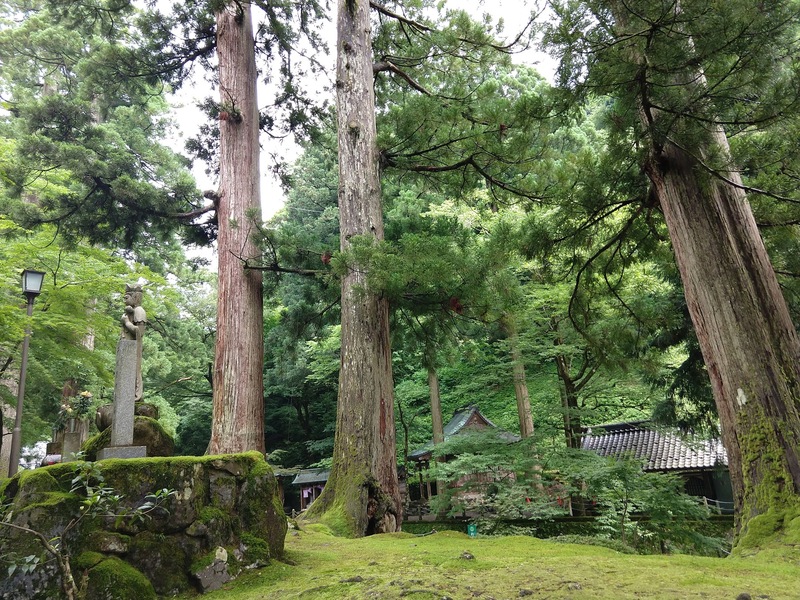 Towering, centuries-old trees are a majestic presence in the temple’s grounds. Some of the trees are held by wires. While the intention is to preserve these magnificent beings, it’s almost sad to see them being held this way, as the trees seem to have already lived their lives. 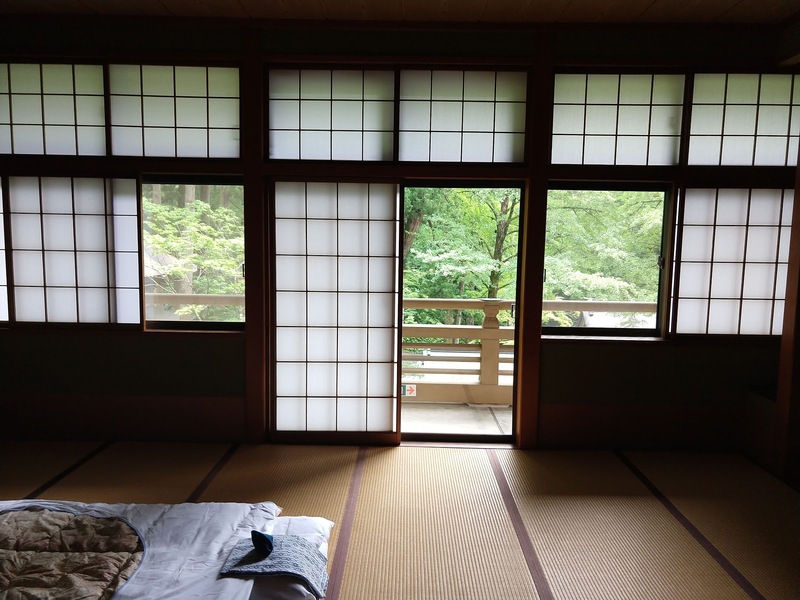 One of the training monks took me to my tatami bedroom. The room included a small table with a tea set, sweets and a schedule, indicating my wake-up time at 3:30 a.m. The room had a handbook on how to fold the futon at the end of my stay, with very meticulous instructions and diagrams. There were also nightgowns, with belts, carefully folded on top of the beds. Views from the balcony outside my room. The landscape is green and moss-covered. The weather was beautifully misty. On the night of my arrival, I was taken to practice zazen at the visitor’s hall, with some other 20 guests. We were instructed to sit in full lotus position and showed how to hold our hands and keep the spine straight. This meditation instruction was not much different from the directions we provide at BZC. 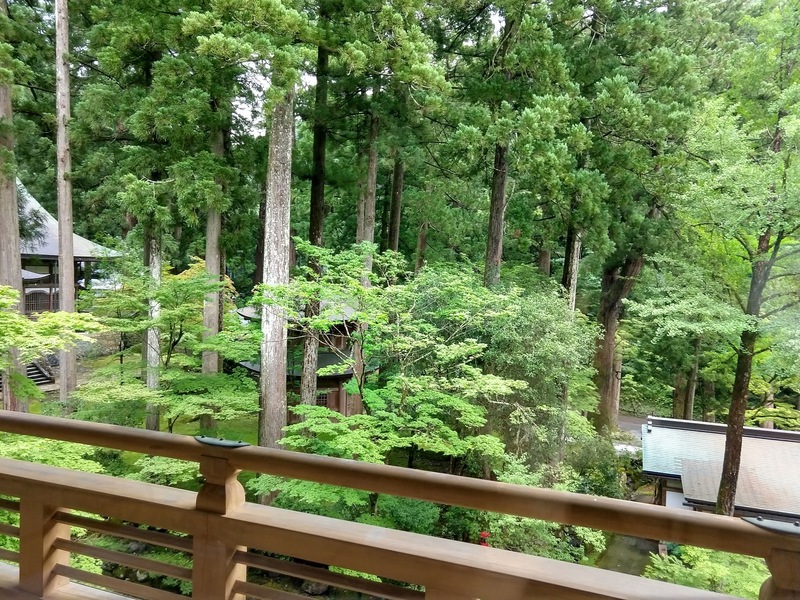 After zazen, we watched a film about the life of the monks at Eiheiji. The training monks spend over a year at the monastery, after which they go to serve as apprentice priests at their father’s temples. The table in my bedroom included a set of chopsticks with chants for the mealtime. The service hall, located at the top of the mountain. The service, which could not be photographed, included about one hundred, fully robed, monks. Their intricate fast movements and beautiful chanting turned the service into an elaborate choreography. Visitors were invited to line up and offer incense to Dogen. 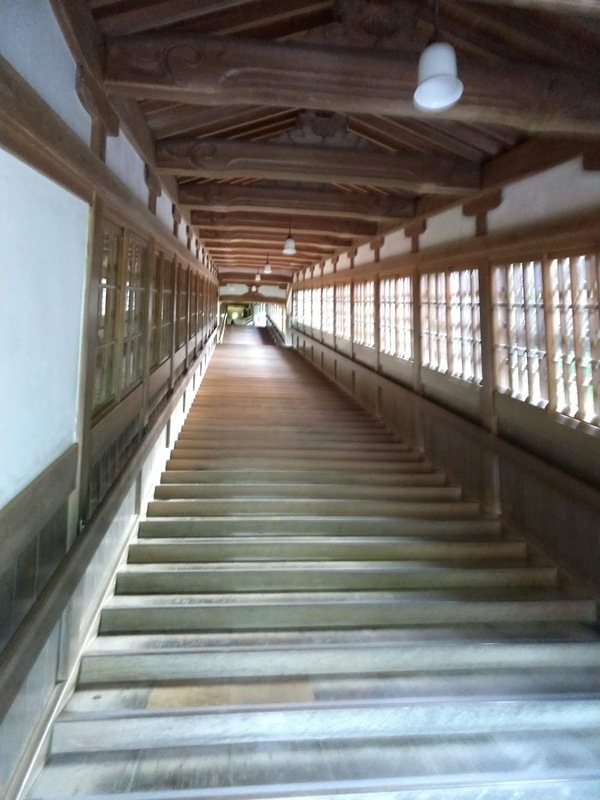 The stairs connecting different temple grounds provided a physical sense of ascension, of rising up, as we walked up each step. They also provided a sense of permeability between temples and the nature surrounding them. One can only imagine how cold it must be in these open corridors during the winter. Breakfast was served in a simplified version of oryoki. 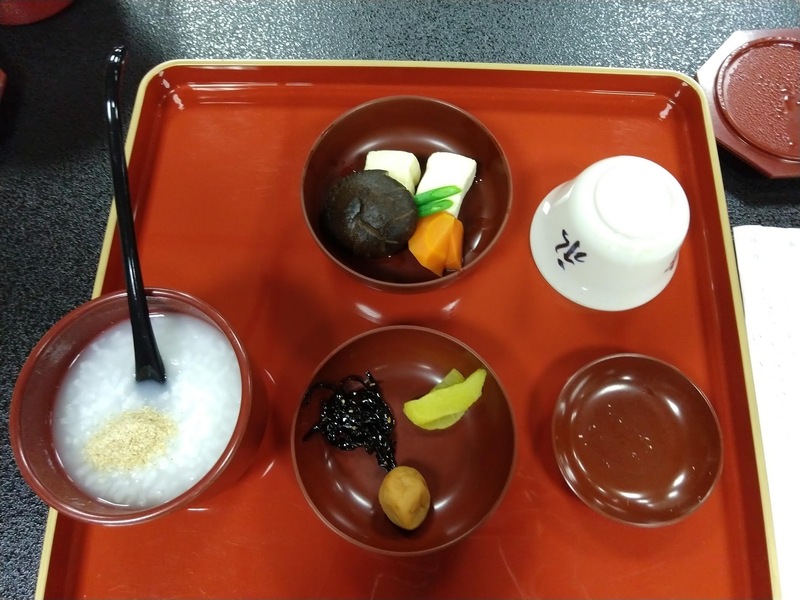 It included rice with gamashio, pickled plums, radish and seaweed, as well as mushroom, carrots and beans. In the midst of the lush greenery there is a statue of Avalokiteshvara on a lotus petal. Avalokiteshvara is a bodhisattva who embodies the compassion of all Buddhas. In Japan this figure is known as Kanzeon or Kannon. 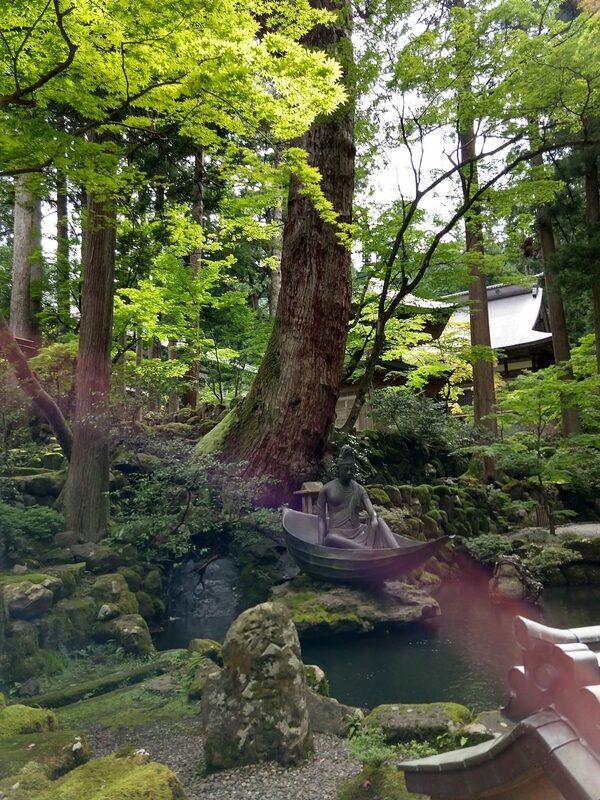 Coming back to America, I was delighted to find out that this statue depicts the story of Dogen’s experience on his way back to Japan from China. Dogen’s ship was met with deadly winds and, while Dogen recited the Lotus sutra, the figure of Avalokiteshvara appeared on the waves and the winds suddenly calmed down. After returning to Japan, Dogen wrote Fukanzazengi (“Universally Recommended Instructions for Zazen”), in which he described and promoted the practice of zazen. After founding Eiheiji, Dogen devoted the rest of his life to transmitting the Buddha Dharma and to training disciples. Our lineage at Brooklyn Zen Center descends directly from Dogen and his teachings.